President Donald Trump, with a poster of himself laid out in front of him, speaks during a cabinet meeting at the White House, in Washington, Jan. 2, 2019. U.S. President Donald Trump pushed again Wednesday for taxpayer funding of a wall along the U.S.-Mexico border, even as he claimed without evidence that Mexico is already paying for it through a new trade deal and that much of the barrier has been built. "Walls work," Trump said at a Cabinet meeting, with a poster of himself lying on the table in front of him. Trump contended, without citing specifics, that 30-35 million people are in the United States illegally. "Our southern border is like a sieve," he said. "We need barriers." Homeland Security chief Kirstjen Nielsen, on a video feed, told the president and other Cabinet members that "fake families" have been entering the United States in an effort to remain in the country. 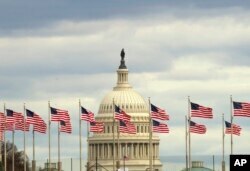 Flags fly in front of the U.S. Capitol in Washington, Jan. 1, 2019, as a partial government shutdown approaches its two-week mark. Later, Trump is set to meet with congressional leaders about his demand for wall funding in a dispute that has closed a quarter of U.S. government operations for 12 days. The U.S. leader blamed the shutdown on opposition Democrats because of their refusal to honor his demand for wall funding, although last month Trump said he would be "proud" to "own" the partial government closure in a dispute over border security. The U.S. leader invited top Republicans and Democrats to the White House for what it called a "border security briefing," talks occurring the day before opposition Democrats take control of the House of Representatives for the second two years of Trump's presidency. 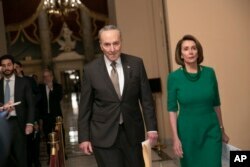 FILE - Senate Democratic Minority Leader Chuck Schumer and House Democratic Leader Nancy Pelosi, the speaker-designate for the new Congress, arrive to talk to reporters at the Capitol in Washington, Dec. 20, 2018. Trump contended on Twitter, "Mexico is paying for the Wall through the new USMCA Trade Deal," even though Congress has yet to ratify it and the pact has not taken effect. He also said, "Much of the Wall has already been fully renovated or built," although Congress has never approved wall funding, even as repairs have been made to existing fencing. "We have done a lot of work. $5.6 Billion Dollars that House has approved is very little in comparison to the benefits of National Security. Quick payback!" The shutdown has forced closure of most operations at several government agencies, with 800,000 government workers either told to stay home or continue to work without pay until the stalemate is resolved. 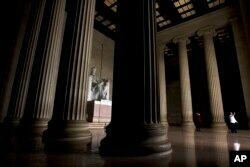 Tourists in Washington are seeing new effects of the impasse. The Smithsonian museums and the National Zoo are now closed until a deal is reached. The National Gallery of Art will be closed starting Thursday. The White House meeting is Trump's first with key Democratic lawmakers since mid-December. As Democrats assume control of the House on Thursday, Speaker-designate Nancy Pelosi says she plans votes on legislation that would fund all of the shuttered agencies through the end of September, with the exception of only extending funding at the Department of Homeland Security, which oversees border security, through Feb. 8. Visitors take their pictures at the Lincoln Memorial in Washington, Jan. 1, 2019, as a partial government shutdown approaches its two-week mark. The proposed legislation does not include the $5 billion in funding for the wall that Trump is demanding in any spending measure he signs. Democrats have previously offered $1.3 billion in funding for other border security measures instead. White House press secretary Sarah Sanders said in a statement late Tuesday that the Democratic plan is a "non-starter" and "fails to secure the border and puts the needs of other countries above the needs of our own citizens." Pelosi and Senate Democratic leader Chuck Schumer have rejected Trump's wall plan as "expensive and ineffective" and say Trump has yet to put forth a plan that has a chance to pass both the House and Senate. Ahead of the White House meeting, Trump and Pelosi traded comments Tuesday on Twitter. 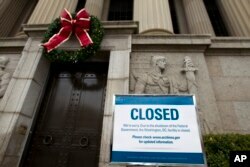 A closed sign is displayed at The National Archives entrance in Washington, Tuesday, Jan. 1, 2019, as a partial government shutdown appoaches its two-week mark. "Border Security and the Wall 'thing' and Shutdown is not where Nancy Pelosi wanted to start her tenure as Speaker! Let's make a deal?" Trump said. Pelosi responded that Trump "has given Democrats a great opportunity to show how we will govern responsibly & quickly to pass our plan to end the irresponsible #TrumpShutdown." Before the shutdown went into effect, the Senate passed a stopgap funding bill that would have funded the now-closed government operations through Feb. 8 without the wall funding. The House passed its own bill that included wall funding. Pelosi said in a letter to colleagues Tuesday that lawmakers in the Senate should now support the new Democratic plan after their earlier approval of stopgap funding, and that if they reject it, then they would be "fully complicit in chaos and destruction" caused by the ongoing shutdown.